McDonalds are a brand that we have all heard of. 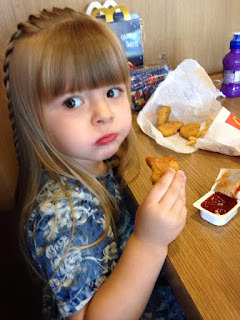 They are a hugely popular brand and kids everywhere love their Happy Meals. Lets face it, adults love them too. I know I do. Don't get me wrong we don't eat it everyday but for a treat every once in a while I don't see any harm at all. It can be very convenient, a special treat and tastes super yummy. When I was younger we used to go every once a while and I remember loving the whole experience. We took Paige for her birthday lunch in May, she loved it. The staff were super lovely and made a huge fuss of her. She came away with a balloon, nice and full from her meal with a lovely little toy. I do often wonder what goes into the meal though. There were all kinds of stories when I was younger and I don't think that many people actually know exactly what's inside. As a mother you need to be aware of what your children are eating, you want them to be happy and healthy and food is a huge part of that. McDonalds can be apart of that too. Everything in moderation. Do you know what is in their burgers? Would you be surprised if I said it was 100% beef with a little added salt and pepper. I know I was but that's it! Nothing nasty, nothing that shouldn't be there, just beef. It also comes from British and Irish farms. Their new good to know campaign is exactly about this and trying to make people aware that it is real, yummy food. thats so awesome you got a sponsored post by McDonalds!